Smallest at the back. It was fiercely hot. The photograph is one of those iconic Lambeth moments – frozen in time for ever on Diocesan Office walls all over the world. But maybe times change. As we stood in tiers where the saints had stood, I pondered the great figures of the past who are remembered in areas of the Blogstead Gardens – Bell, Temple and the others. I doubt if they and their contemporaries would have sung Amazing Grace in 680 part harmony while they waited in searing heat for the photographer to GET ON WITH IT. Which he did. Meanwhile, we carry on conferencing. Today is a day out. I’ve chosen not to go and preach in a parish in the Canterbury Diocese. Lots of people with much more interesting stories to tell than mine. We’re going to do some family visiting and catch our breath. We start with Eucharist at 7.15 am and it’s been non-stop until I write the blog somewhere before or after midnight. We’ve done ten days of that and there are seven to go. And it’s been hot and humid. The environmental discussion was interesting. In my group it became a ‘wake-up’ call from bishops from the Third World to the rest of us. We need to hear it. We’re still wrestling with the Indaba Group method. We’re going to try some variations on the working method next week. In our Bible Study we’re going to continue to talk about the difficult stuff and bring that to the Indaba Group. Maybe. But elsewhere there are signs of hope – difficult agendas are coming to the surface and being explored patiently. 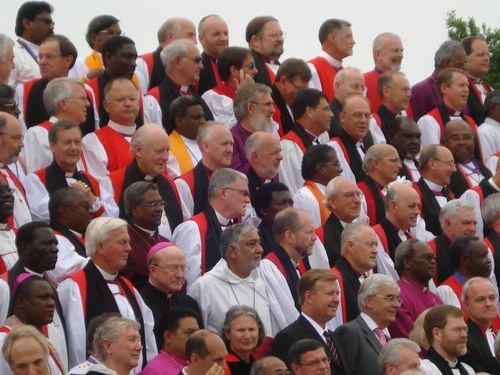 So was the photo of more than just Bishops? I ask because I see a couple of men in suits and ties, and therefore not very Bishopy-looking. Great photo! But where are all the women in purple?? ?